Hi, my name is Greg Van Tighem. I am the fire chief in Jasper Alberta, an avid cyclist, an MS Society Ambassador, a volunteer MS Advisory Council Board member, and the volunteer trail coordinator in the Hinton MS Bike Tour, and for the past few years a top fundraiser in the Hinton Tour. I am on a mission to help end MS.
Over the past seven years I have raised over $250,000 through numerous activities and initiatives, such as barbeques, car washes, poker rallies, farmers’ markets, bottle drives, raffles, hockey tournaments, auctions, and, of course, my 3000 kilometre solo cycling journey from Wickenburg, Arizona to Jasper, Alberta last May. You can see the details of my trip on the “2013 Highway 93” header. 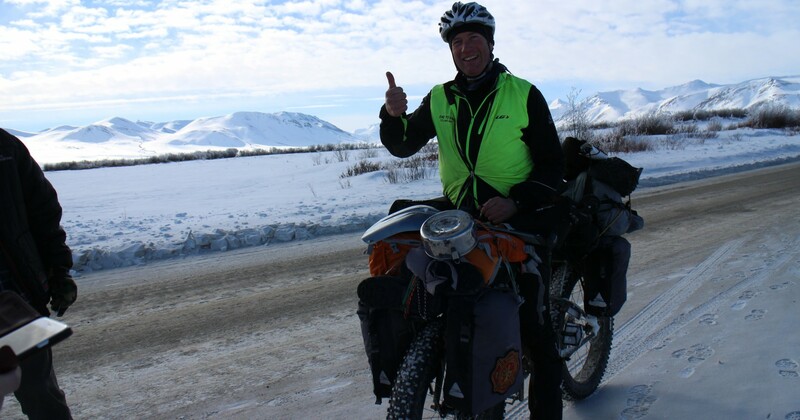 Starting in late February of 2014, I will be peddling a Free Wheel Jasper ‘Kona Wo’ bicycle over 3,000 snowy, cold and icy kilometres from Masset, a town on the island of Haida Gwaii and the westernmost point of the Yellowhead Highway 16, to Winnipeg, Manitoba in the east. This will be another solo trip, decked out in North Face gear from Wild Mountain Jasper; but this time, on a ‘Fat Bike’ donated by Freewheel Cycle Jasper. Along the way I will be visiting and networking with Fire Departments, Rotary Clubs, Chambers of Commerce, MS Society offices, local schools, local newspapers, and others. I will be documenting my adventure on Facebook and Twitter, while also maintaining a detailed travel blog, photo journal, and video blog. My fundraising goal for this trip is once again $93,000 for the MS Society. I will be soliciting donations before, during, and after my journey, and any monetary support will go 100% to the MS Society. My personal rule is that I buy my own food, hot chocolate, and beer, unless I am offered a legitimate consumable handout while I am on the road. I am honoured to once again be sponsored by, Freewheel Cycle Jasper, Wild Mountain Jasper, Optic Nerve, Jasper Brewing Company, Mountain Park Lodges, and Tekarra Colour-Jasper. I will be promoting my hometown of Jasper as the best tourism destination in the world and the Yellowhead Highway as the best destination travel corridor in Canada and thus have partnered with Tourism Jasper and a number of Yellowhead Highway businesses for major marketing support. I have a number of objectives I wish to achieve on this crazy journey. First and foremost is to raise funds and awareness for the MS society and a close second is to spread inspiration and hope to all those suffering with MS or any other debilitating disease. Beyond this, I will visit as many Fire Departments and Rotary Clubs as I can, seek out the best micro-brewery IPA , the best kobasa and porgies, etc. along Highway 16, and learn as much as possible about the people, local history, and attractions along the way, all while battling the extreme cold and harsh road conditions with a smile on my face. I am doing this because everyone who lives with Multiple Sclerosis is in dire need of a cure. I am doing this because these people living and dealing with MS require daily support services and resources to ease their pain and struggling. I am doing this because researchers are on the cusp of finding a cure and they need funding to continue. I am doing this to spread hope. And I am doing this because I could use a bit of fresh air and there is nothing more exhilarating than pedaling afat bike down the Trans-Canada highway in the winter. First off, realize that this isn’t all about the money. It is also about raising awareness and hope. The $93,000 target is important, but just as important is bringing the problems associated with Multiple Sclerosis to light. I am not only looking for people who will sponsor my cause but also for folks who will help to spread the word. It is extremely important that my journey can reach as many people as possible, so I ask you to please help me out by circulating my initiative and my information among your contacts. I have had tremendous support in the past and look forward to seeing an end to Multiple Sclerosis, with your help.